FLINT, Michigan—You’ll find Angie McChristian on the Flint River or maybe riding her bike through Carriage town. Or picking up trash. Or bringing together neighborhood business associations. Or mobilizing volunteers. Or just talking to people, finding out how she can help. This is the life of an AmeriCorps worker in Flint. McChristian serves on the Urban Safety Corps stationed at the University of Michigan-Flint. It coordinates patrols on the Flint River Trail and is part of the University Avenue Corridor Coalition. UM-Flint Police Chief Ray Hall (center) speaks at a press conference about the many partners that have come together to make the Flint River Watchers program successful. Now in its second year, AmeriCorp workers and volunteers patrol the river, clean up debris, talk to residents, and pass out dog treats. There are 125 full-time AmeriCorps workers in Flint. Over the summer that number blooms to 200. They are working in Flint Community Schools on mindfulness and community education efforts through the Crim Fitness Foundation. They are working with children as part of the Reading Corps. They are implementing the city’s Master Plan and offering programing at the Boys and Girls Club. They are at the United Way and at the Red Cross. They are in neighborhoods and community meetings. The service program has expanded massively here in the last two years, when there were just 25 Americorps workers in Flint. McChristian has made Flint her home for the last 12 years and is now in her second year with AmeriCorps. She often works on the beautification team with the Urban Safety Corps and finds herself still learning about the city she loves. Seeing the way the trees come into bloom along the river—and realizing for the first time that she also can kayak down the river. The water crisis left many residents feeling like no one would listen or that they couldn’t make an impact. She sees her work and the work of others changing that perspective by providing encouragement and a platform to get involved, be heard, and make a difference. “I love it,” McChristian said. This year the Urban Safety Corps purchased two additional golf carts to help with patrols along the Flint River Trail and added weekend hours to operate seven days a week. During patrols, AmeriCorps and volunteer watchers talk to residents, pick up debris, give treats to dogs, and report any suspicious activity directly to UM-Flint central dispatch. 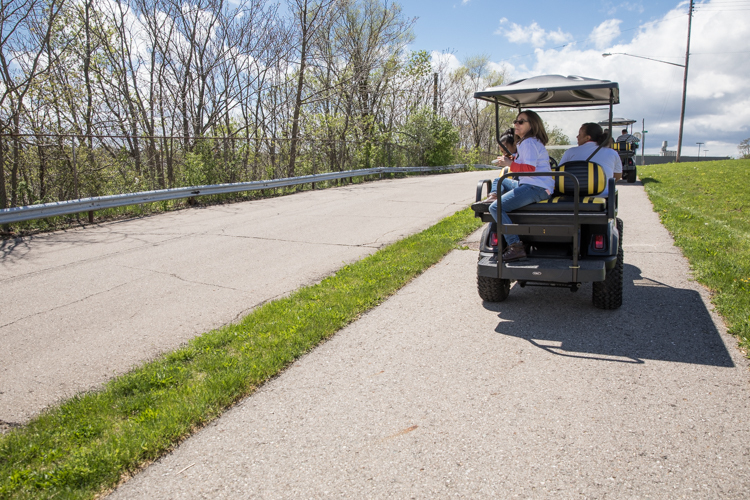 One of two new golf carts patrolling the Flint River Trail as pat of the Urban Safety Corps, an AmeriCorps program operated by the University of Michigan-Flint. The river trail patrols officially kicked off May 1 and will continue through Oct. 31. They are part of a $200,000 Urban Safety Corps grant through the United Way of Genesee County. 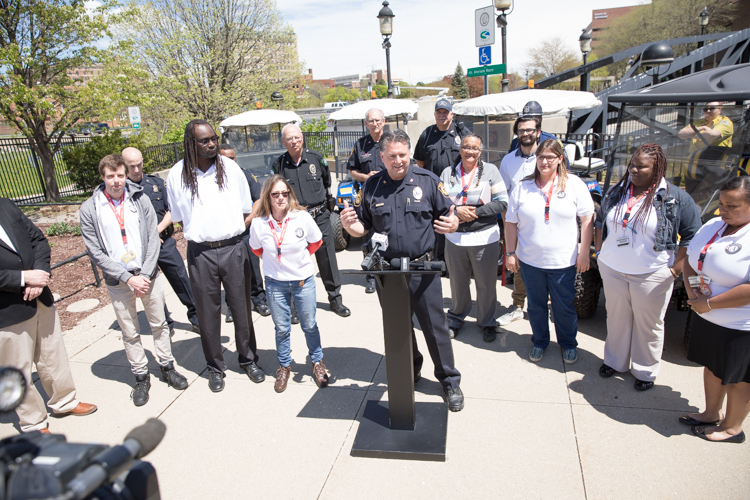 “This is an example of the transformational power of partnership in the city of Flint,” said UM-Flint Police Chief Ray Hall, who noted there was not a single crime reported on the river trail last year. He also gave thanks to police from the city of Flint, sheriff’s department, and state police as well as Genesee County Parks rangers for assisting with the patrol effort. Jamie Gaskin, United Way of Genesee County CEO, gave special thanks to the many partners—and especially the volunteers who make such an important impact on the community. Additional volunteer opportunities are available. Check unitedwaygenesee.org for more information. Look for another major impact on May 19, 2017, when 120 to 140 AmeriCorps workers will convene in Flint for a massive pickup effort of the Flint River Trail and eight properties in the city.